The past few months have been full of surprises. I had a month-long contract job running a graduate program’s residency that left me pretty tired. I got my drivers license! I applied for and got two part time positions at my alma mater. Oh, and I started putting the wheels in motion to open my own Etsy shop. It’s been a bit crazy, to say the least. I’ve been sharing most of my food stories via Instagram lately, but I’ve really missed my blogging time. I will be keeping up with things on my Instagram profile, bentbecca52, but I’ll also be able now to start sharing things back here again! I miss my writing time and I really need to reclaim it! So onward! Look for more writing on the blog coming shortly. I have found the perfect line up to make my own hazelnut latte at last! 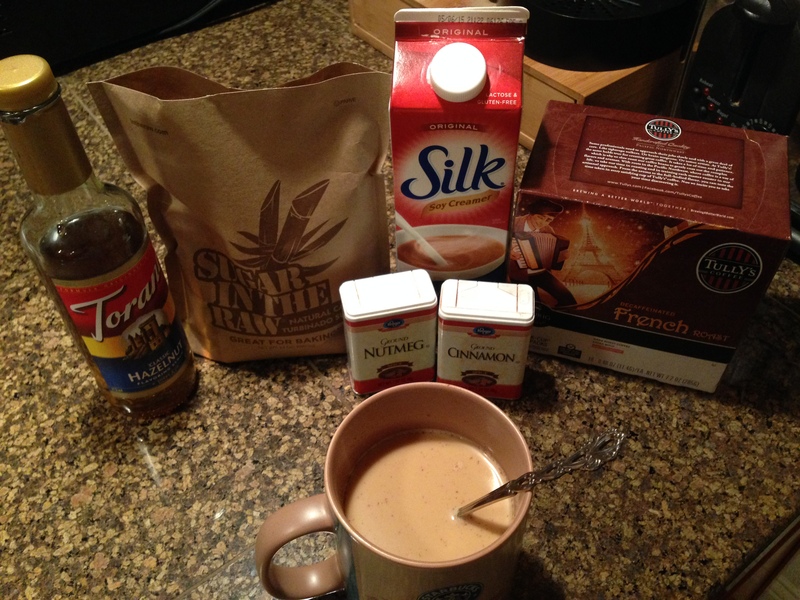 I posted the other day about trying to find the perfect creamer component for an at home hazelnut latte, which ended up being the Silk soy creamer. With that in mind, I picked up some Sugar in the Raw, a bottle of Torani hazelnut syrup, and a new decaf French blend of dark roast coffee by Tully’s. I use a Keurig to brew my coffee, so for this recipe sake, just use 10 oz of dark roast brewed coffee. Stir it all up and enjoy with a book, while writing, or on the way to work! Let me know what you think in the comments. I am on a quest to find the perfect hazelnut latte recipe to make at home. Like many, I really like a good latte from Starbucks, but it’s just too expensive to enjoy regularly. So I developed my own taste test to try out what seems to be the most important variable in the latte: the creamer/milk. I brewed myself a mug of decaf coffee (can’t do caffeine, unfortunately), and poured a bit into three glasses. In turn, I added each creamer to their respective glass. When I started making coffee at home in the fall, I began using the So Delicious hazelnut. But when I order my latte from Starbucks, it’s made with soy milk (I don’t know which brand they use). I was prepared for anything to work. What surprised me was that neither of those won the taste test. 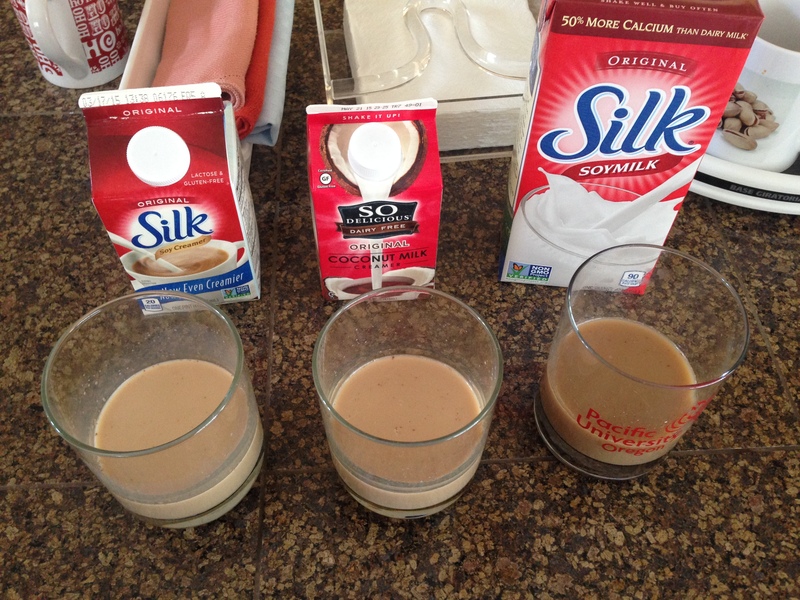 The Silk original creamer came out on top with the best flavor and mouth feel. It’s smooth and lends itself well to adding in spices and other flavors. Overall, best of the three. Now it’s on to perfecting the rest of the recipe. I bought some Sugar in the Raw, a hazelnut syrup, and a new brew of hazelnut coffee. I will report back! As many of you know, I am lactose intolerant. I’ve written about it here before. 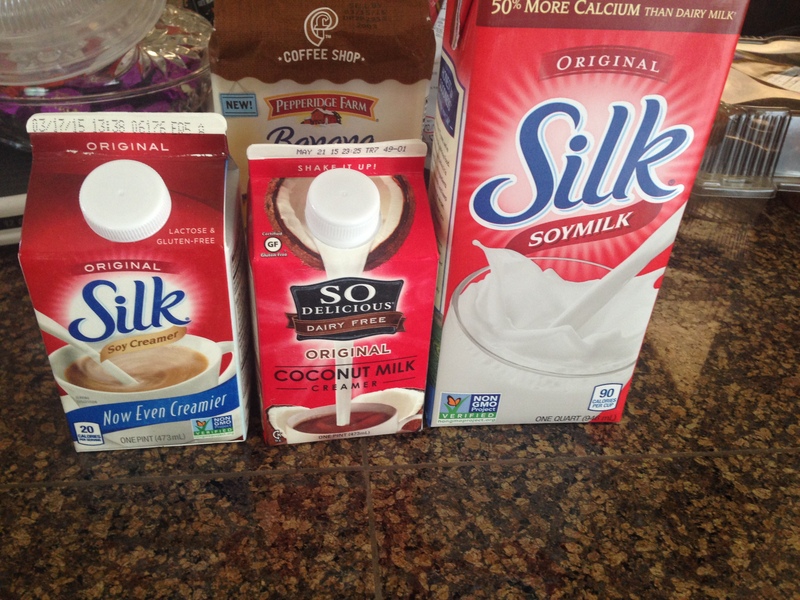 I’m constantly on the hunt for dairy alternatives that taste good. On one of my last trips to Whole Foods, I decided I’d grab a bunch of the different offerings and try them out. I was tired of going without just because of my intolerance. Starting in the lower left and going clockwise: Treeline treenut cheese in the scallion flavor, Parma! vegan Parmesan, Lisanatti Ricecheeze cheese alternative sticks, Tesse mozzarella log. Treeline: Made from cashews, this was a nice soft cheese style, very spreadable. I tried this on some pita chips and the scallion flavor was a bit overpowering to start. I let it sit in the fridge a few days before trying it again, which mellowed it out considerably. It wasn’t a favorite, but I’d consider getting it again. With that in mind, I also tried the garlic and herb flavor. That was amazing! It goes really well on chips like a dip. It also mellowed after a few days, but it wasn’t so overpowering to start like the scallion was. The downside, though, is that it’s a bit of a spendy item. Parma: Holy dairy-free cow, Batman! This is made with walnuts and nutritional yeast, but it hits all the notes of a good hard Parmesan. I add it to basically any noodle dish and it’s instantly tastier. It happens to be really good on EarthBalance’s dairy free mac and cheese. Like crazy good. I’m on my second bottle, and even my mom has started using it (she notoriously dislikes the faux cheese products I have). I cannot say enough good things about this. I works well in red sauce, as any good parm would, as well as on just plain buttered noodles. I can’t believe I’ve gone without this for so long! 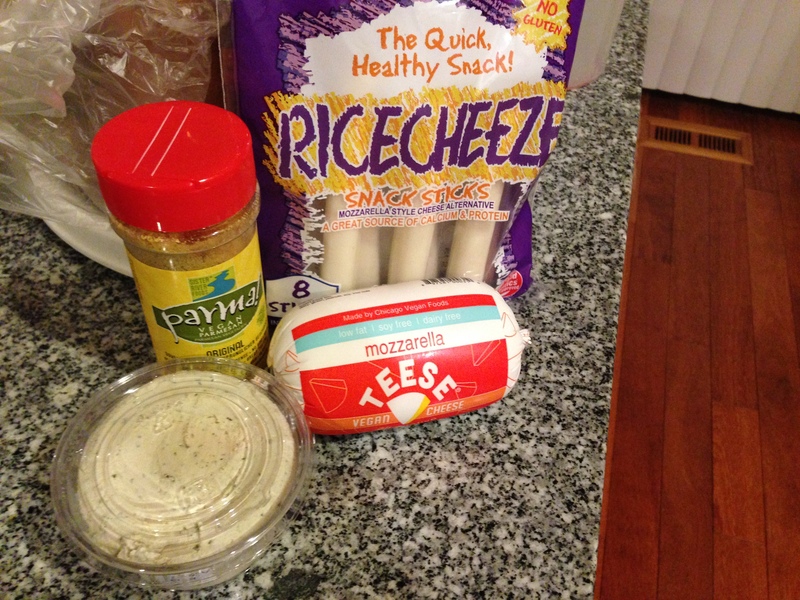 Lisanatti Ricecheeze: This rice based string cheese style cheese stick fooled my mom. She couldn’t tell the difference between it and real string cheese. I have to say that it is hands down the best alternative cheese taste I’ve ever had. And it’s such a handy snack! Highly recommend trying this. Tesse: I always feel a bit bad giving a negative review, but I have to with this one. I don’t remember what this is made out of, but whatever it is tasted horrible. I bought it hoping to grate it for a pizza, especially since it mentions on the packaging that it melts and stretches. It does melt pretty well, and there’s a decent stretch to it, but it’s got the consistency of some kind of chemical putty. Almost like softened silly putty. Very rubbery, and an awful smell to it. I tried it both fridge fresh and heated, both equally bad. Overall, it was a good taste test. The Parma and Ricecheeze were resounding successes, and the Treeline, while needing a few tweaks, worked out well too. Has anyone found a good dairy alternative cheese that works well to make pizza? a delicious dinner in the works. Today may be the greatest food holiday ever. 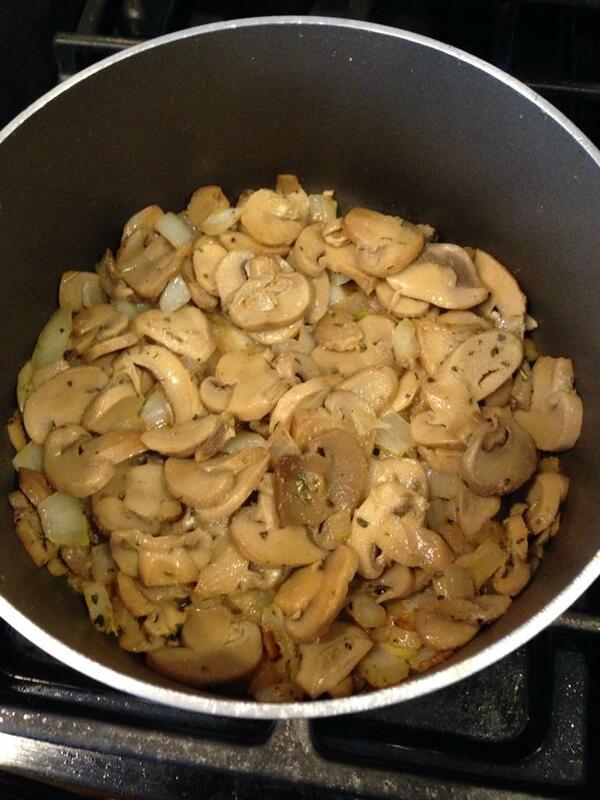 I do not think I can begin to describe the love affair mushrooms and I have. We go through them crazy fast in the house because I’m constantly putting them in salads, stir-fries, sauteed veggie mixes, omelettes, etc. Hell, I will just saute them with some onion and garlic to stir into pasta, no sauce. 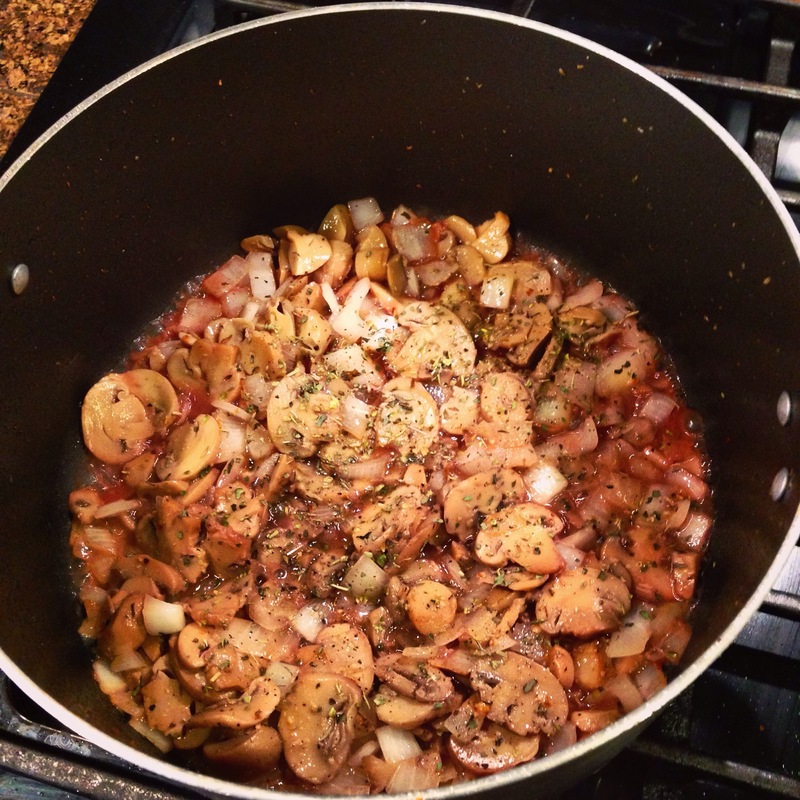 I think my favorite recipe, though, is one I learned when I was prepping to go to Spain. A few friends and I had a party where we all brought Spain themed food, made our own sangria (white and red), and ninja chalked (definition: a group of slightly inebriated adults grab a box of chalk and draw ridiculous but imaginative narratives in the cover of darkness). Heat the olive oil in a pan that has a cover. 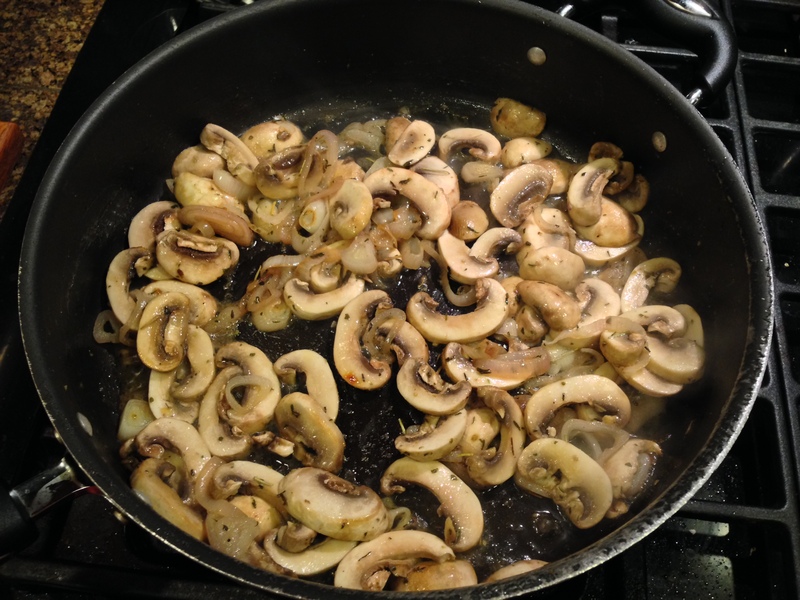 When the oil is hot, add the mushrooms, salt and sherry. Cover, and lower heat. 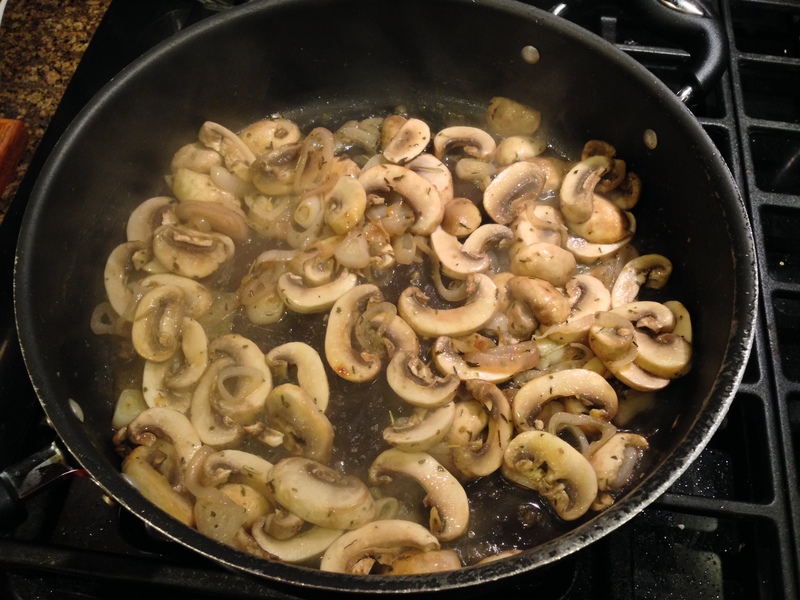 Cook until liquid is released from the mushrooms, about 10 minutes. Drain and set aside. Toast bread slightly, just to dry it out a bit. 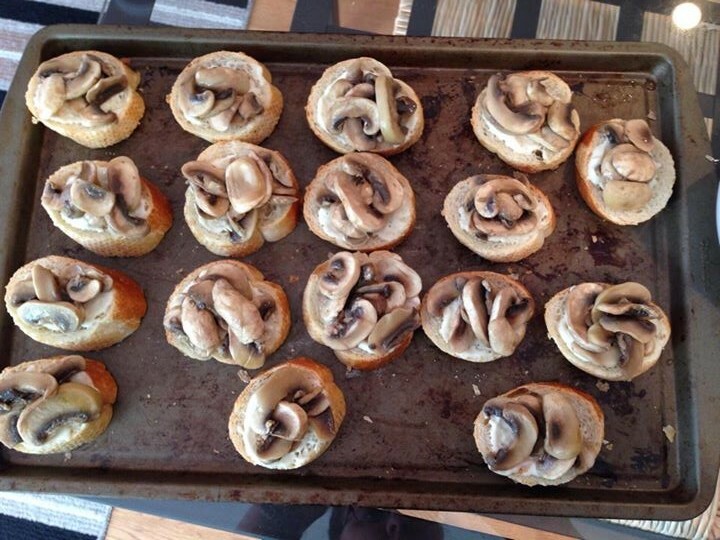 Spread with alioli and top with mushrooms. Broil for about 30 seconds or until alioli starts to bubble. For the most part, I eyeball this. In the mayo, mix the salt, garlic, and lemon juice. Cover and refrigerate for at least half an hour (the longer, the stronger the flavors). Consider adding pepper to taste (I don’t usually, but then I’m not a huge pepper fan). 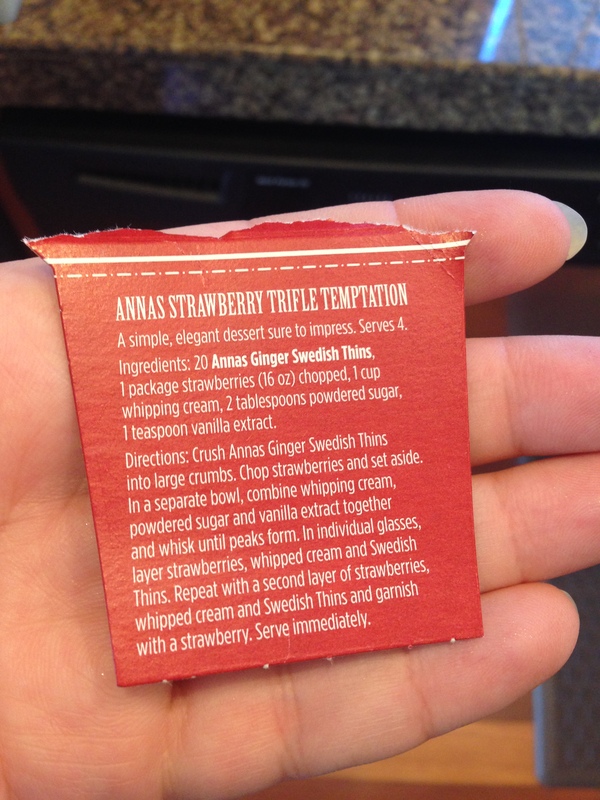 A few weeks ago, before the craziness of learning to drive and starting a new business took over my life, I said I’d share a recipe that I found on the end of a box of the ginger Annas cookies. When I made this for myself, I will be honest, I did not follow the letter of the recipe. 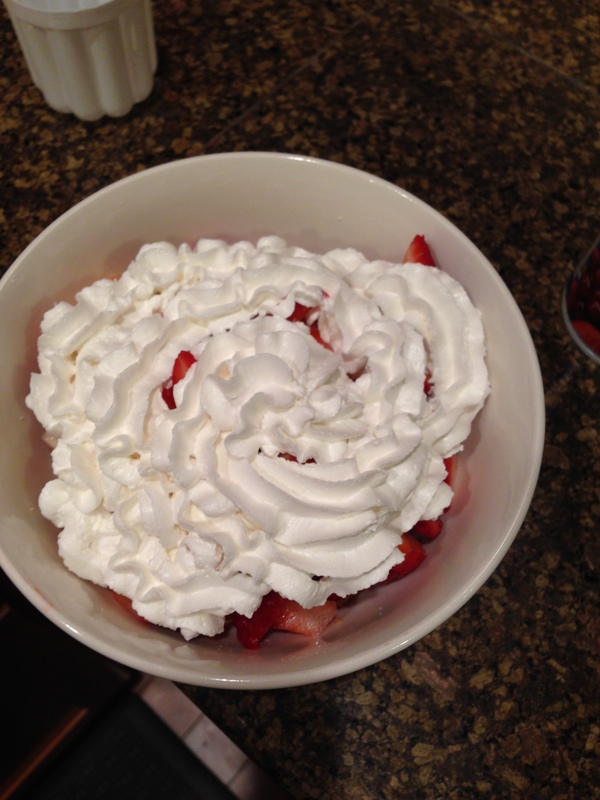 Instead, I took a handful of cookies and crushed them, then layered them with chopped strawberries and my soy whip cream. It turned out to be really tasty and I could see serving it at a dinner party or something like that. I stopped into Whole Foods yesterday, and of course I had to swing by the bakery section to see what they had going on. Usually there are a few vegan options, like the chocolate mousse and parfait I’ve mentioned before. But not this time. Of course I’ve got to get a chocolate fix, and my dad had settled on getting a few tartlets (which had a curd or filling that I couldn’t eat), so this led me to staring down a selection of macaroons. I’ve tried a few of their flavors before, and I would not repeat most of them. I had a raspberry that was pretty tart, and a vanilla that had a strange flavor I can’t quite describe. 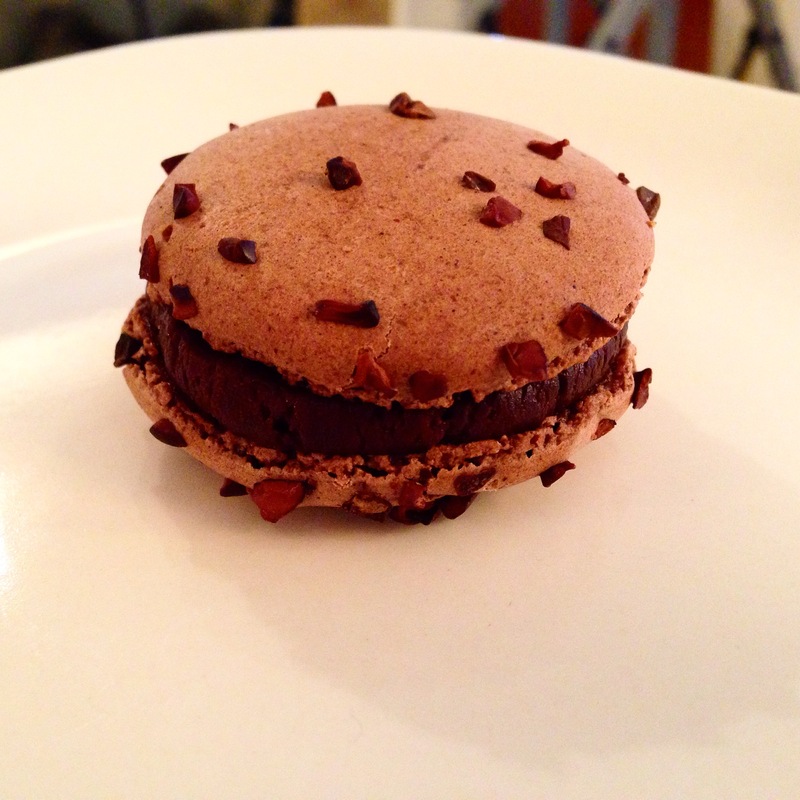 But it’s pretty hard to screw up chocolate, so that’s my go to macaroon. They are a bit pricey ($1.99 each where I live), but the two chocolates I got were totally worth it (one of which is pictured above). But as much as they rock, they’re too expensive to get often. Coincidentally, my grandmother bought me a macaroon backing set (silicone mat, recipe book, and piping bag with pieces) for Christmas. I started looking into making the macaroons myself. I bought the almond flour, some flavorings, and I already have some food coloring. But the recipe book that came with the kit doesn’t make the instructions all that clear. So I started poking around online and found a few places that have videos about making the cookies and how to fill them. 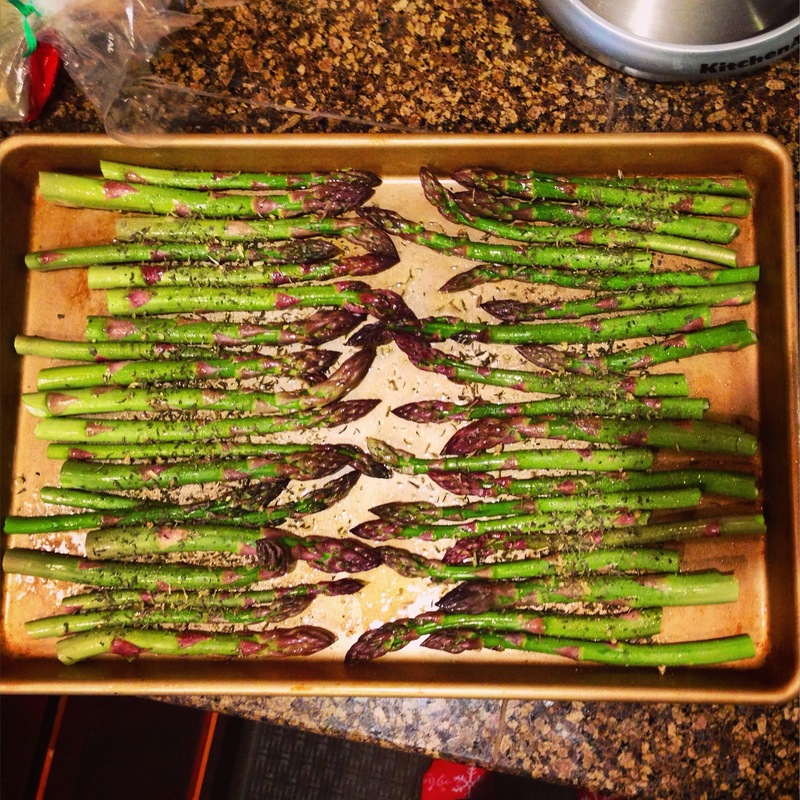 It’s never fun seeing “level: advanced” on a recipe. But I’m determined to actually make some, so I thought I’d ask if any of you have tips or experience making macaroons. Any tips fellow foodies? Enjoy my recipes and tales from the kitchen? Want to help me buy ingredients for future posts? Click below! Much thanks! Want to stay up to date with my posts? Click the follow button below and my latest posts will show up in your inbox!